If you don’t have the insights and wisdom for mastering the mortgage markets and educating your clients and partners, you’ll lose to selling on price vs. advice. Our special guest for Mortgage Marketing Radio this week is Barry Habib. Barry has been a prominent voice and advocate of the mortgage industry for over 25 years. 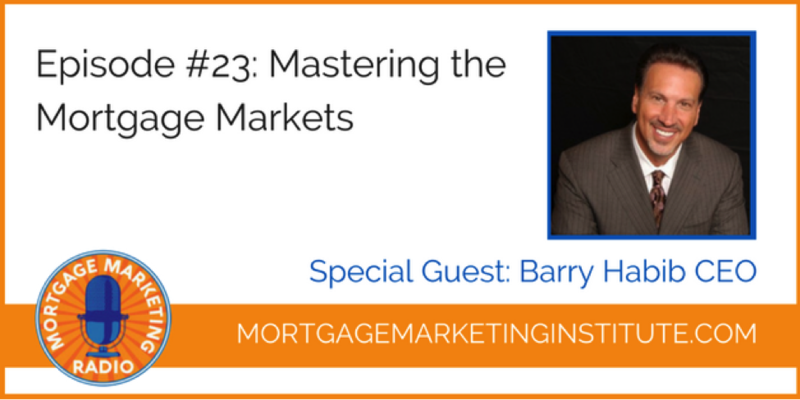 Barry is also the founder and CEO of MBS Highway, a company which helps you interpret and forecast activity in the mortgage rate and bond markets, helping you more intelligent in the advice you give to clients and referral partners. However, what you might not know is that Barry also had a very successful career as a mortgage loan originator with over $2.2 Billion in personal production to his name. We cover a ton in this episode, including the markets, the impact of the election, Barry’s market forecast for Q4 and beyond, what it takes to succeed today as a loan officer versus 5 years ago and how to adjust to the market accordingly. This is a truly insightful episode, in which Barry shares how to become a better, more informed and more professional mortgage loan originator leveraging knowledge and market insights to influence more clients and referral partners to choose you as their lender of choice. You can leave a rating & review for Mortgage Marketing Radio on iTunes. Finally, you can subscribe on iTunes to get all new episodes when they are released.